A cardiovascular activity, swimming works every major muscle group in the body and strengthens your heart and lungs. As with most cardiovascular exercises, you can perform it at least three times weekly to build stamina, tone muscles and lose weight. A low-impact form of exercise, swimming is an exercise that anyone can engage in, regardless of age or fitness level. If losing weight is your goal, the American College of Sports Medicine recommends that you do at least at least 150 minutes of moderate-intensity cardiovascular exercise, like swimming, each week. A 185-pound person can burn up to 888 calories by swimming vigorously for one hour. The kicking, stretching and arm movements that swimming requires also tone muscles and build lean muscle mass. Water buoyancy makes the body feel lighter and eliminates back and joint stress, making it possible for you to work out for longer time periods. As muscles develop and strengthen, your muscle tissue will burn calories in the body. Your ability to lose weight, however, is dependent upon you burning more calories than you consume. To increase your weight loss, focus on eating a balanced, healthful diet rich in complex carbohydrates, healthy fats and lean proteins. 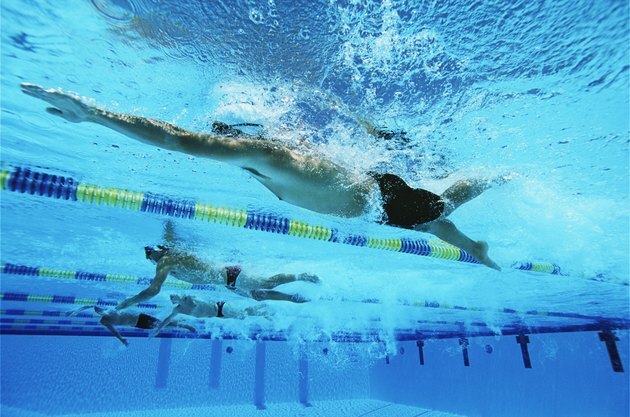 Interval training while swimming will enhance the strength of your cardiovascular system, notes "The Sunday Times." Swim intensely for 10 minutes, take a 3 minute break and swim again for an additional 10 minutes until you swim for a total of 30 minutes or longer. This boosts your metabolism, builds stamina and increases your muscle strength. Interval training also burns calories, which is necessary for weight loss. Performing swimming exercises tones muscles in the upper and lower body. Water offers about 12 times more resistance than air. Therefore, with each movement, you are resistance training. Because you are working against the water when you swim, your muscles grow, get stronger and increase in mobility. This gives the body a toned, lean and defined appearance. Individuals who swim regularly may initially experience weight gain. Swimming increases muscle mass quickly, which causes weight gain since muscle weighs more than fat. Because fat loss and muscle building occurs simultaneously, the numbers on your scale may rise. Rather than giving up, continue swimming to ultimately achieve weight loss goals. Swimming can also increase your appetite, so it is important to stick to a healthy eating plan after swimming. Combine your swimming with a healthy diet to create a caloric deficit if your goal is to shed some pounds. Health Services At Columbia: Swimming -- Good For Weight Loss?